The Northeastern area of Italy consists of 4 regions and borders Austria and Slovenia to the north and east. These boundaries are naturally drawn by the range of the northeastern Alp mountains. 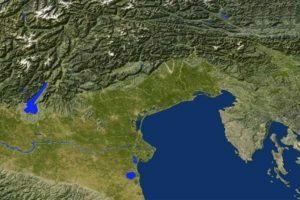 To the south, it is bordered by the Adriatic Sea and The Marches region, and to the West by Tuscany, Liguria, and Lombardy regions. The capital of each region are Trieste in Friuli Venezia Giulia, Bolzano in Trentino Alto Adige, Venice in Veneto and Bologna in Emilia Romagna. The population of these four regions is around 11,659,000. 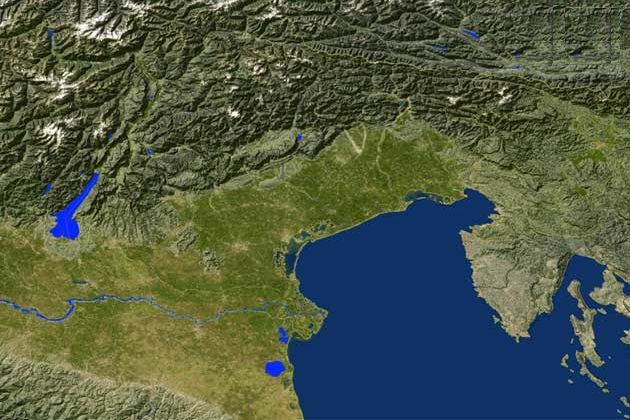 The morphological conformation of this territory is varied: with its multiple important rivers, the vast plain that extends over the Adriatic Sea, also called the Po valley, is encircled by the Alps on the north and east, the Apennines on the west and the Adriatic Sea on the south. The coastline of the northeastern area is quite regular and it features many long sandy beaches. Just in the area of Trieste, The coastline starts to get more rocky with small creeks of sand beach.